Yakshagana, one of the most illustrious traditional theatrical forms of South India, obviously finds its firm roots in the Natyasastra ofBharata. 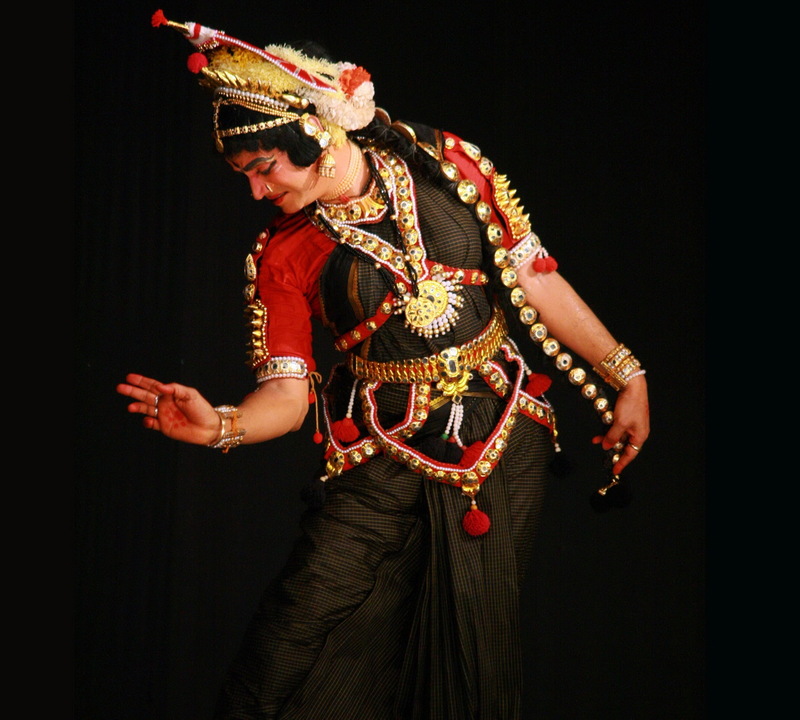 It is a profound and popular performing art of Karnataka. Especiallyits Northern School (Badagu Tittu) is known for its visual treat both in respect of dance andcostume. It emerges out as a complete theatrical form and makes a grand synthesis of form and content in an aesthetically marvelous manner. 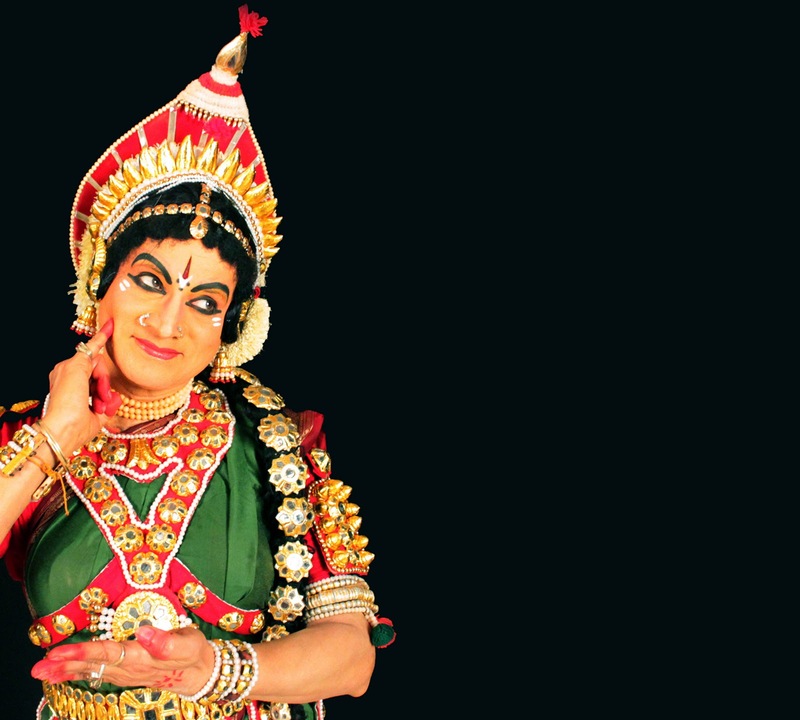 Solo performance in Yakshagana style is an entirely new and refreshingly original innovation in the classical dance-drama systems of India. Here the Natya (theatrical) form of the original art is kept intact and the Bhana / Bhanika (solo) dimension is aesthetically developed. 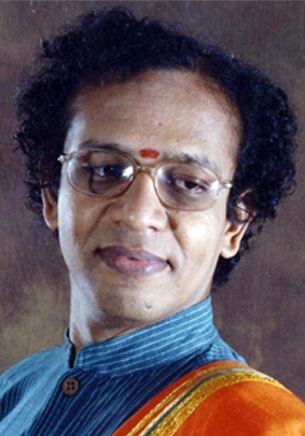 Dr. R. Ganesh is a renowned Sanskrit scholar, poet credited with reviving the ancient art of Avadhaana and an Indologist well versed in the nuances of all classical Indian arts. Dr. R. Ganesh is a graduate of Mechanical Engineering, A holder of M. Sc from IIsc, Bangalore and a master’s degree in Sanskrit. He is a literary wizard and has contributed a number of valuable works to the world of literature. He has been successfully pioneering the spread of knowledge and culture through his lectures, writings and compositions. In this dance theme, the mental state experienced by the love struck heroine (Bhamini) in eight situations in a time duration of 24 hours is depicted in eight episodes. Even though Bhamini depicts a flourishing Sringara Rasa, the hidden thought is the expression of feelings of Jeevatma searching for Paramatma in the path of devotion for attaining salvation. This is based on three characters from Mahabharata and Bhagavata – Yashodha (Vatsalya Bhava), Rukmini (Madhura Bhava) and Droupadi (Arpana Bhava) who were deeply influenced by Lord Krishna. 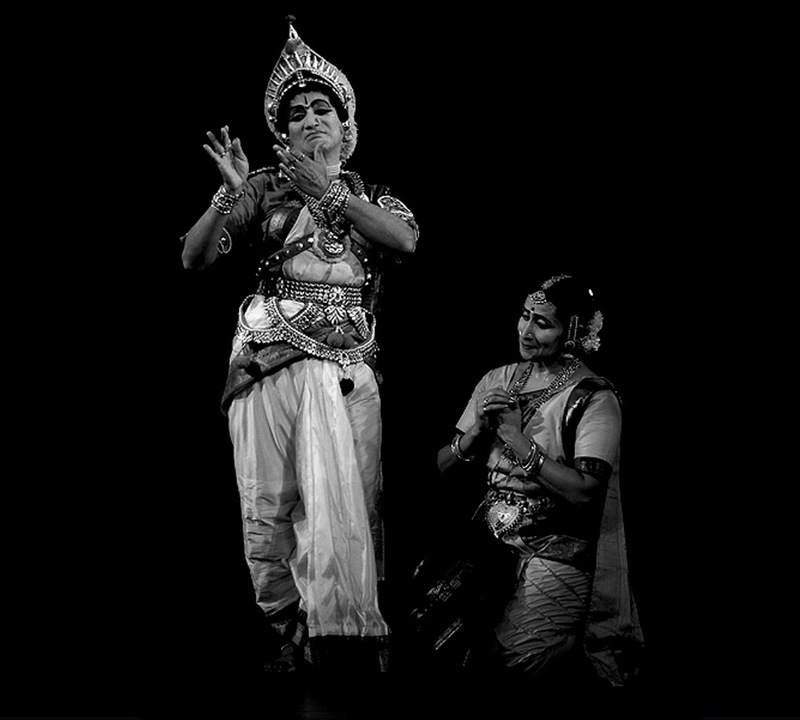 This is based on three characters from Mahabharata and Bhagavata - This unique full length programme covers the Poorvaranga of this art. It starts with the salutations to the stage-Mother Earth, the eight directions, the learned spectators and heralds the ten incarnations of Lord Vishnu. Later two items in Pitika Streevesha (initiating the romantic feminine themes) are performed. This is based on three characters from Mahabharata and Bhagavata - This explores the character of Radha as an ideal lover. It is a one evening story. The whole programme is a grand musical treat full of rich Abhinaya. 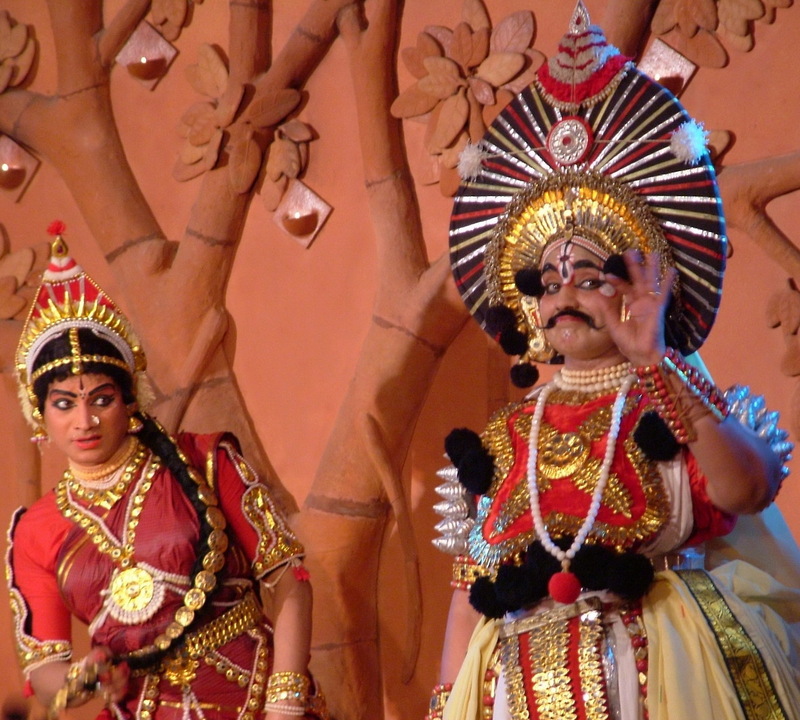 The most challengingly attractive productions based on the theme of Ramayana. This has a total splendor of Vachika (verbal communication) along with the mesmerizing Angika (articulation of the body), fantasizing Aharya (costume and make-up) and engrossing Sattvika (moods and emotions).The whole episode is a fascinating encounter with the demonic charms of Shurpanakha that evokes divine aesthetic experience. This is entirely based on the legacy of Ramayana and profoundly explores the sublime character of Sitaa. Here Sattvikabhinaya and pathos reach their zenith. Equally challenging is the sustained crystallization of the epic dignity. For the first time in the history of the annals of Yakshagana, time tested poems of a few eminent poets of Kannada. Thus DVG, Kuvempu, Bendre. 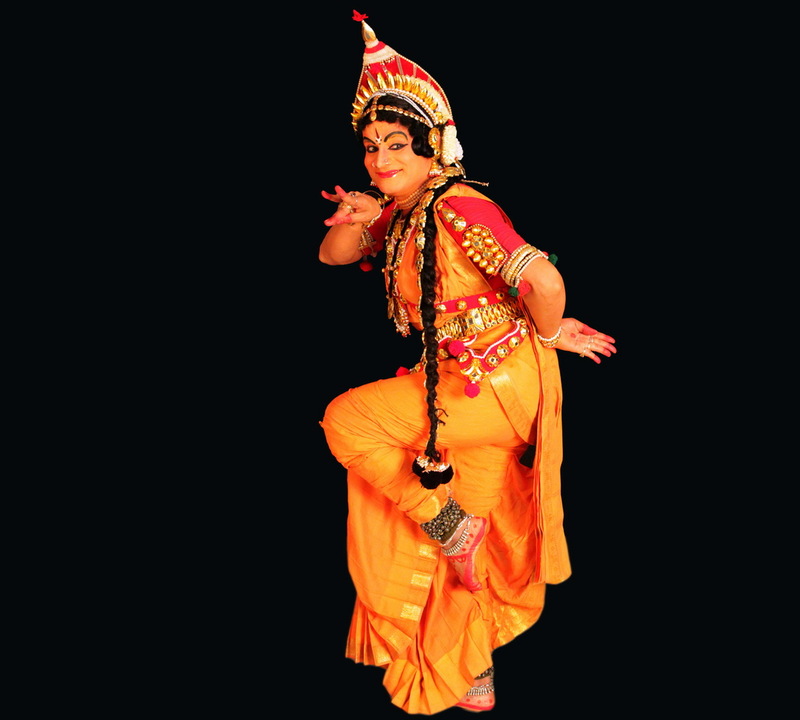 Thinamshri, K.S.Na and others are brought in to the fold of tantalizing Yakshagana. An extension of this is also successfully attempted where even the earlier master poets such as Pampa, Kumaravyasa, Kanakadasa, Basavanna, Akkamahadevi are also adopted. This reveals the tragic story of Amba the fiery character from Mahabharata. Here a poetic justice is also made to her sad fate. 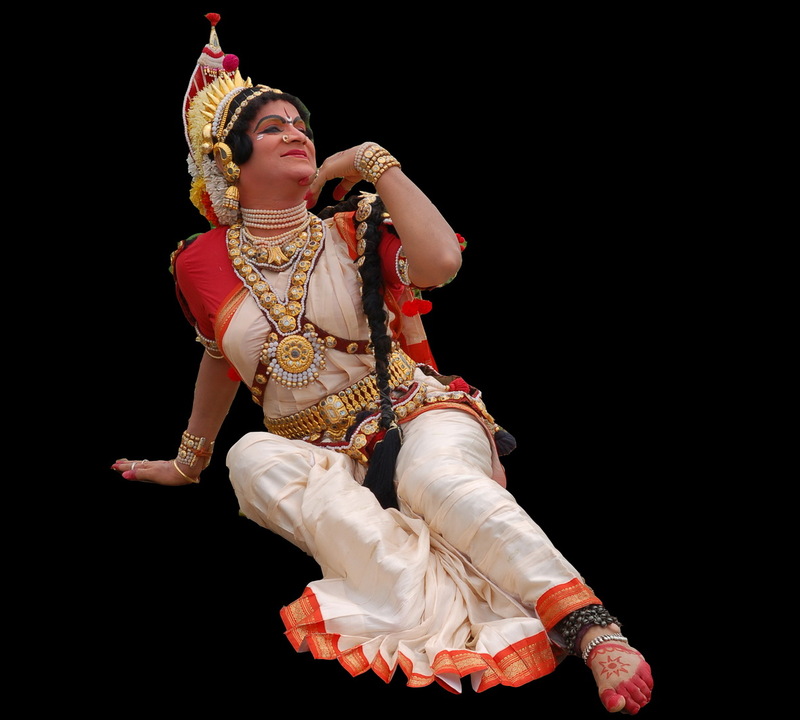 The all time beautiful devotional songs of the sage poets Purandara and kanaka are aesthetically adapted to the rhyme and rhythm of Yakshagana. A happily blend of Sringara and Bhakti with a telling message are accomplished. 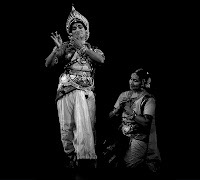 ‘Nadumaneyalli Yakshanatya’ - a programme where in the artiste reaches out to at least fifty people with the venue being a person’s residence. The focus is on literally involving audience in the character he enacts and to reach out to art aficionados when they are driven away by television and other media. Mantap has performed at over 400 homes all over India and succeeded in taking art to homes. 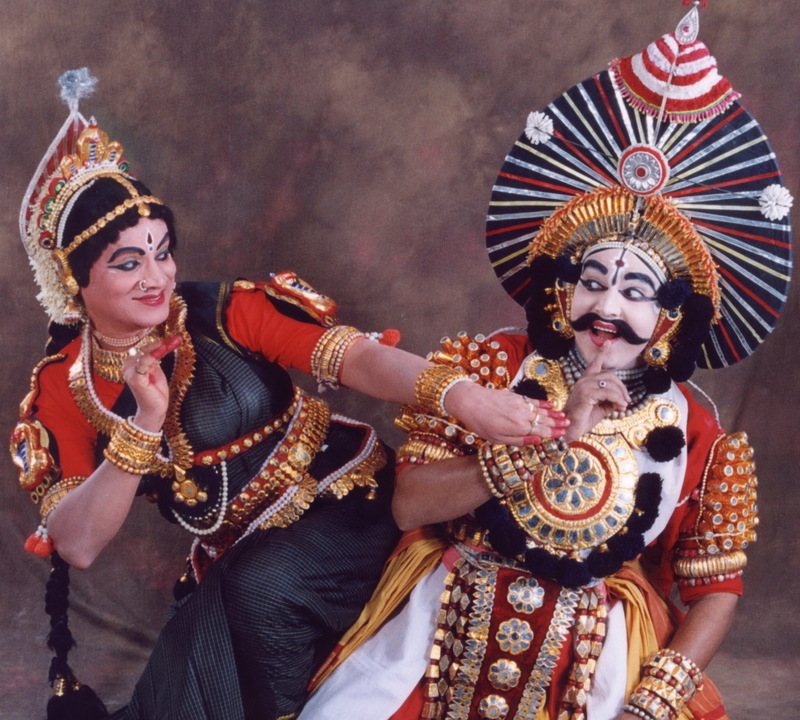 This is a duo Yakshagana involving the love affairs of Arjuna (enacted by Kondadhakuli Ramachandra Hegde, an eminent Yakshagana artist) with Ulupi, Chitrangada and Subhadra. 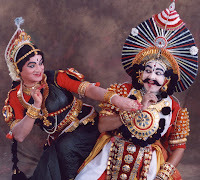 Over fifty ragas are employed for this one production itself which is unheard not only in Yakshagana but also in any other classical theatrical presentation. This deals with the love and marriage of Nala and Damayanthi that was negotiated through a swan. Mantap was paired with the noted Bharathanatyam artiste Smt. 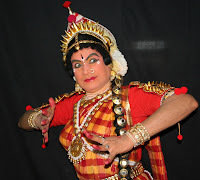 Sundari Santhanam who enacted the role of King of Nishadha state, Nala Maharaja for this play. 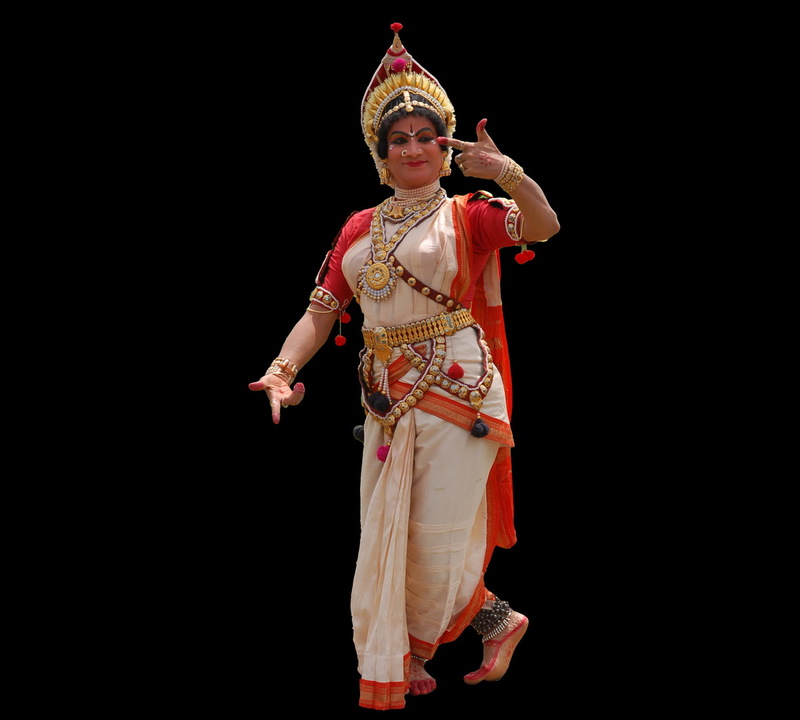 This dance presentation is a confluence of two art forms Yakshagana from Karnataka and Kuchipudi from Andra Pradesh. 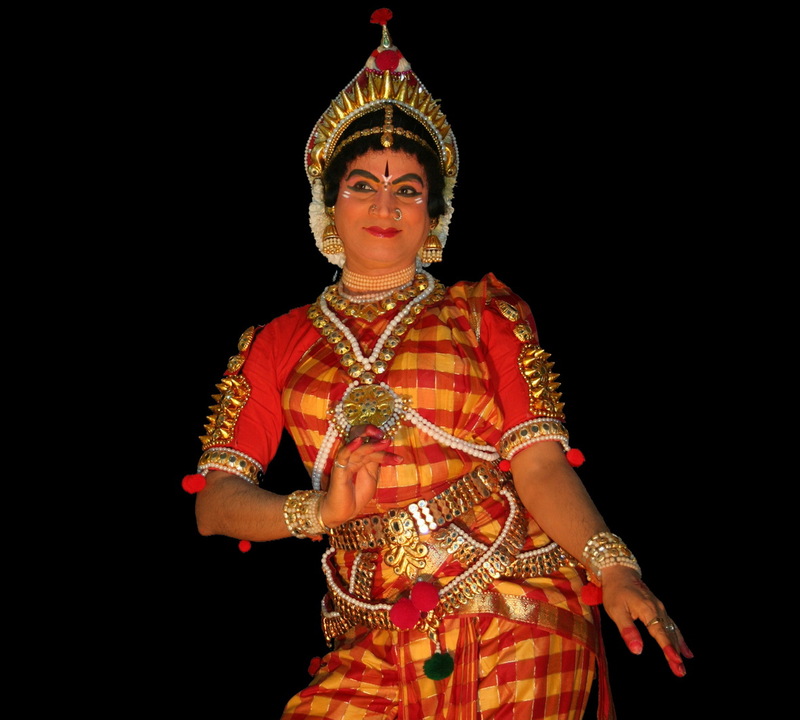 Vyjayanthi Kashi an acclaimed Kuchipudi danseuse dons the role of Satyabhama - who epitomizes materialism and unparalleled beauty and Mantap as Rukmini - who symbolizes Bhakthi and devotion to Lord Krishna. This act consists of an episode from Ramayana. 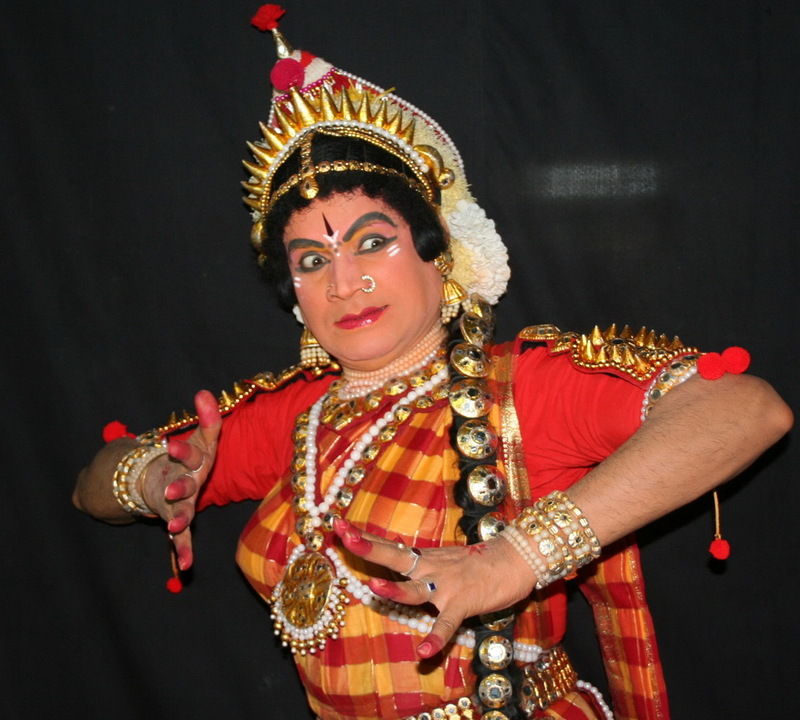 Here the role of Manthara is played by Sri Chapparmane Sridhar Hegde, renowned in playing comedian roles in Yakshagana and Kaikeyi is played by Mantap.